This article is about the emperor of the Gallic Empire. For other people with the name Marius, see Marius. 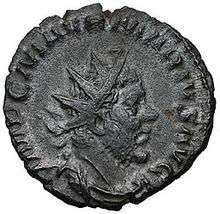 Marcus Aurelius Marius was emperor of the Gallic Empire in 269 following the assassination of Postumus. According to later tradition, he was a blacksmith by trade, earning the nickname Mamurius Veturius, a legendary metalworker in the time of Numa. He rose through the ranks of the Roman army to become an officer. He was present with the army that revolted at Moguntiacum (Mainz) after the emperor Postumus refused to allow it to sack the city. They murdered the emperor and in the confusion that followed, the army elected Marius to succeed Postumus. According to the ancient written sources, Marius’ reign lasted for two or three days only, before being killed by a sword of his own manufacture. This tradition is probably partially or entirely incorrect. Based upon the number of coins he issued, a more accurate length for his reign would be at least two or three months. Marius is listed among the Thirty Tyrants in the Historia Augusta. It is said that he was chosen because his names were evocative of two great Romans of the Past, Marcus Aurelius and Gaius Marius. ↑ Historia Augusta, Tyranni Triginta, 8:1; Thomas Habinek, The World of Roman Song: From Ritualized Speech to Social Order (Johns Hopkins University Press, 2005), p. 25. This article is issued from Wikipedia - version of the 2/1/2016. The text is available under the Creative Commons Attribution/Share Alike but additional terms may apply for the media files.